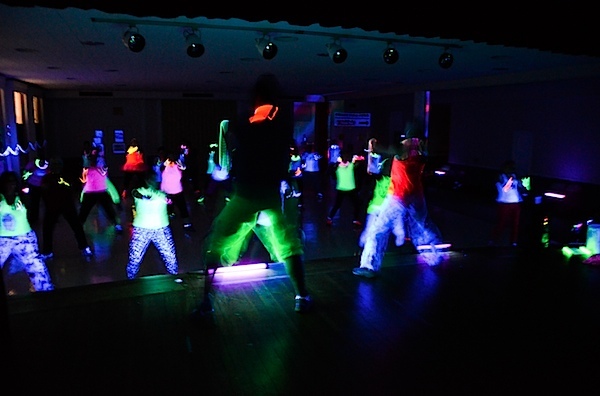 My Halloween Zumba Glow Party was so much fun, almost all of my class participants excitedly asked me to throw another one. Of course, I was more than happy to do so! I’d been wanting to throw a blacklight party for (literally) years, and it was great to see my idea was a winner. On the day after Halloween, I hit up the local holiday shops in search of black light deals. I bought 5 from the shops (50% off) and ordered one online (thank you, Amazon prime!). 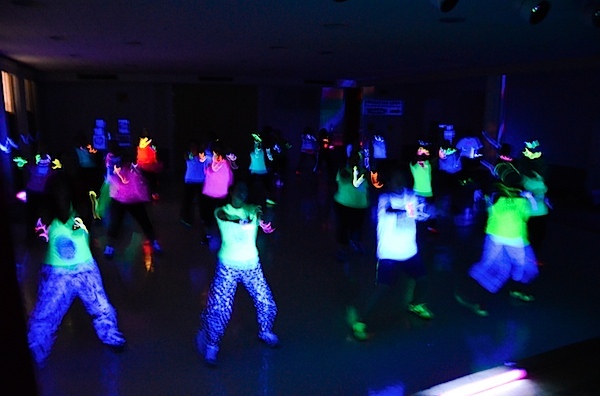 I’m seeing many glow parties in my future. I didn’t invest in all these lights for nothing! I have to thank my wonderful class assistant team and some volunteers for coming early to help me set-up. These types of parties are not easy! Though, they are worth it. With my experience from the first party and a new light configuration, I think we were able to get the room extra glowing! 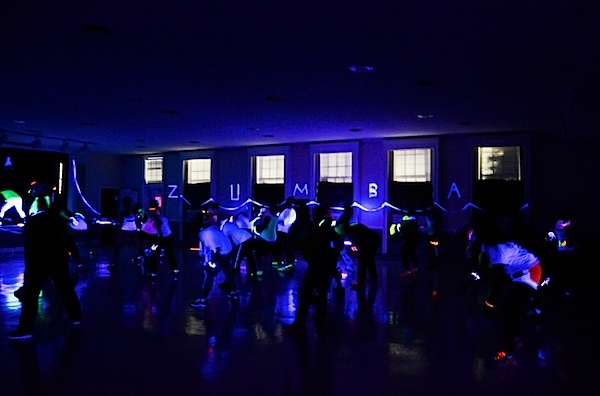 We also added a fabulous “ZUMBA” feature on one wall, and this is just the beginning. I’m hoping to build on my resources bit by bit each year. I already have ideas for ways to spice up my next party! Speaking of which, people asked me to do the next one around Halloween again! Looks like the next party is tentatively scheduled for October. Oh, and one of my favorite things about a glow party is how dark the room is. I love telling my class, “If you’ve ever wanted to dance like no one’s watching, then now is your opportunity. 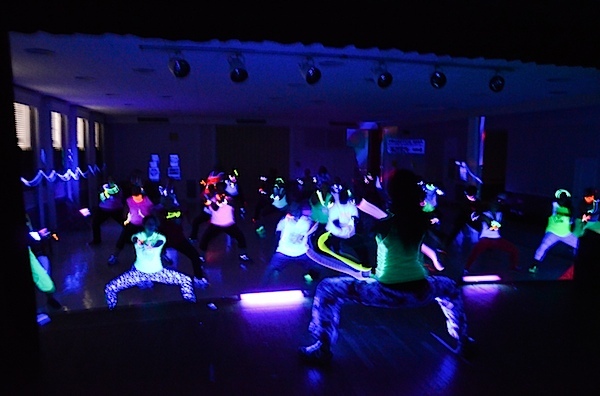 Because pretty much…no one can actually see you in these lights!” I think it makes people work extra hard. Woohoo! Fun and effective! 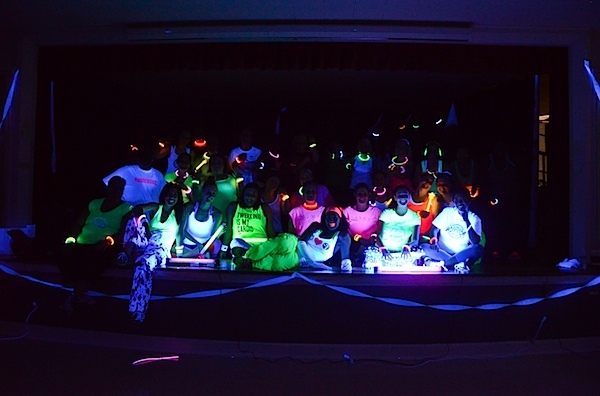 Glow on! « Protein Baked Goods: Yay or Nay? I signed up for a Zumba event on Valentines Day here in Norfolk, VA and thought of you right off the bat! Looks like you had a blast and I am hoping that the one I am doing is as fun!